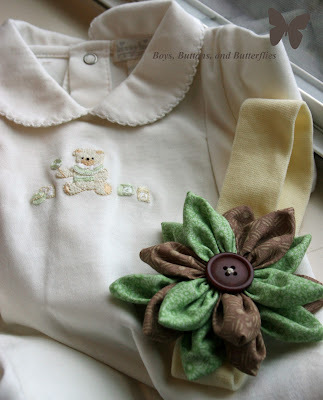 I finally found two beautiful outfits the other day at the sweet boutique at the hospital/doctor' office. If you remember, I couldn't find ANYTHING nuetral. So I bought this off-white sleeper with the tiniest hand embroidery of a bear with beige/brown/green. Go figure...When I brought it home, I felt like it needed "something". I decided to make a girl accessory. A headband with a flower and button accent. And yes, I used fabric scraps again! I don't like the yellow color of the headband itself...so that is on it's way to being fixed as you read. I also might make a wee bit smaller flower....we will see! Hoping to show you the "boy" accessory I am working on today! If not....maybe by the end of the week!